Born February 4, 1985 in Cincinnati Ohio, BiZ made a mission of getting money before anything. When left in the care of his Grandfather daily, his mother worked to provide while his father perused money in the fast life. BiZ began at only the tender age of 3 seizing profit. While his friends were outside playing games, BiZ played his own. His Grandfathers skill in the game of pool sparked his interest. After a short time and the aid of a step stool, he accompanied his Grandfather to pool halls, and to so the surprise of the owners of the buildings, he was taking the money of grown men, beating them left and right, while his Grandfather was placing bets on the table and putting the money away for BiZ to spend wisely. BiZ found the love of music in junior high school while in the choir. He took part in writing a lot of the music and learning to play some instruments such as the piano, drums, and trumpet. His singing quality was sufficient but he wanted to think bigger. He wanted to do something that nobody else had done before, and thus he was in fact the first official rapper of the choir at Shroder Paideia Middle School. He continued to write lyrics throughout High School, and in the process he did it so well that a local label (Wha Den Records) felt that he would be an asset for writing music. They were right. He wrote all the songs including there single which received radio play. While ghostwriting for Wha Den, and a single bringing in profits, the label decided that paying BiZ was not an option. BiZ wanted what was due him, and with compound interest. Not only did BiZ and his Grandfather take them to court and was awarded more that what was agreed upon, he also made it his business to crash their album release party, dissing everyone on the label including the owner on their own beats, battling them in the public, exposing them for not writing their own songs, and embarrassing them so bad that neither of them ever had the guts to pick up a mic again. BiZ at the time only wanting revenge didn’t consider the spotlight until names of Cincinnati such as K-Riley, and Tocka told him he should consider taking the game seriously. While working and developing his craft with Bino (CEO of Natiboy Records) BiZ’s name and number was passed on by a fan to Mike Brantley who founded Brantley Boy Records. BiZ found Mike to be speaking his language and Mike was impressed to find BiZ to be a real artist. BiZ along side Gauge Brantley (Mike’s brother, and front man of Brantley Boy) were a 2 man combo for the stage. BiZ liked being and remained a member of the label but wanted something he could call his own. He and friends he grew up and hung with like to call themselves The Wildboyz Click…thus BiZ took it to a business level in bringing to life Wildboyz Records. BiZ never took part in the game of drugs or slangin dope of any kind nor has he lied and put it in his music for he feels not only is it disrespectful to those who have had to, he doesn’t have the slightest idea how a person would tell the world what he has no knowledge of. BiZ has accomplished a lot, and as gained a lot of connections, affiliates, and partners. He impressed the likes of DJ Dynomyk. In doing so, Dynomyk became BiZ’s personal DJ, and continues to be surprised when the “Young Star” takes the stage every time. 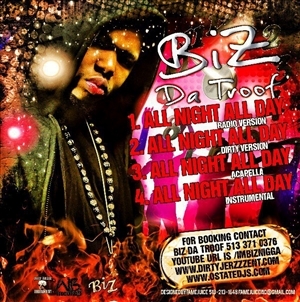 The young artists has managed to put out numerous hits for the streets to rock to such as, “Wildboy“, “I’m da Troof“, “You Don Want None”, “She Got Potential”, and “See You 2marrow.”(which has a remix) After making his mark, and gaining respect of faces in the city, BiZ found that his roots would be yet another source of profit in his music career. Shroder Paideia kept up with his career, and have hired him to write and perform anthems for their basketball and football programs. That has also enabled him to stretch his gift out to Withrow High as well. BiZ has numerous projects with the group Wildboyz, but his solo projects include Repeck It or Check It,(His 1st Album) Cincinnatiz Secret Weapon,(The Mixtape Sampler) and his latest album I’m 1st U 2nd. He has been a special guest performer for The Cincinnati’s Greatest 2 years in a row, The Urban Idol 2 and 3, and has been labeled as by his fans as the Troof, Cincinnati’z Secret Weapon, The Last Hope of OH-10.